Eureka, CA (August 23, 2018) – It’s been a long two months for outlaw kart racers in the Humboldt County area. 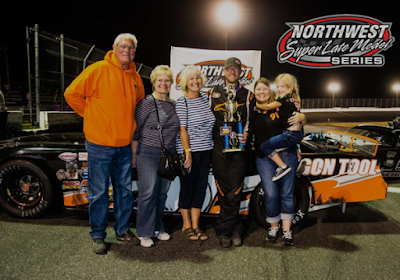 The most recent race occurred all the way back on June 21st during the Redwood Acres Fair. The delay between then and this Saturday was for good reason as this weekend’s Humboldt Outlaw Kart races will be the dawn of a new era for outlaw kart racing in the area. A brand-new permanent 1/8-mile track has been built in place of the fairgrounds’ old rodeo arena which is in the southwest portion of Redwood Acres, adjacent to the BMX track. 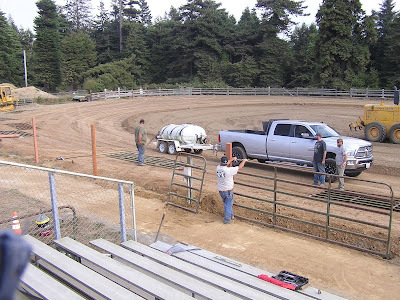 The previous 1/10-mile dirt circuit was located in the infield of the 3/8-mile paved Redwood Acres Raceway oval. However, other motorsport events necessitated the track having to be restored throughout the year. The new track will be to the benefit of racers and fans and the new, bigger track will provide a new challenge for the drivers. The Mill Yard will be presenting this Saturday’s races and all six divisions will be participating. The beautiful new outlaw kart bullring would not have been possible without the hard work and support of numerous people. Thank you to Ryan Ahrens, Nick Green, John Jameson, Kevin Jameson, Jamie Jorgensen, Jordan Miclette, Casey Mitchell and Ryan Walters for their dedication to not only seeing the new track come to fruition but for going above and beyond in making it a place we can all be proud of. Humboldt Outlaw Karts would also like to thank our division sponsors Champagne Attorney Service for the beginner box stocks, Williamson Financial Group for the box stocks, Wes Green Landscaping for the 125/250cc karts, Fortuna Wheel & Brake for the old fart karts, Miclette Family Racing for the pure stocks and NorCal Automotive for the 500cc/open karts. Also a huge thank you to Wes Green Landscaping, Steve’s Septic Service, Eureka Payments, John’s Used Cars And Wreckers, Automotive Workshop & Fabrication, The Mill Yard and Ultimate Yogurt for sponsoring the Humboldt Outlaw Kart races. Rochester, WA (August 18, 2018) It’s been a winning month for Alan Cress. 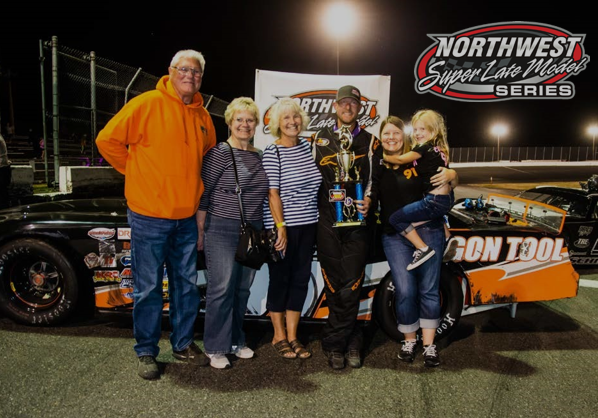 Coming off a victory at the Miller 200 just a couple weeks ago, Cress was able to back that up by winning the South Sound Speedway 125 in the second 2018 outing of the North West Super Late Model Series, Inc. (NWSLMS). Cress and Brook Schimmel (Woodland, WA) had a great battle for the lead, with Cress making a move to the inside to take over and lead them to the checkered. The lead changed six time during the course of the event. Trenton Moriarity (Monroe, WA), an early leader, would also battle Schimmel in the closing laps to take over second position. Schimmel, who led the most laps of the feature, had an impressive run and took the final podium spot. Tayler Riddle (Naches, WA) and Ian Graham (Agassiz, British Columbia, Canada) would round out the top five for the night. Brandon Ash (Roseburg, OR) and second generation Moriarity brought the field to green for the 125-lap event. Ash quickly took over the lead with Evans making quick work of Moriarity in second. Evans would chase down Ash and take over the lead. Contact between pole setter Brittney Zamora (Kennewick, WA) and Ash would bring out a caution. Zamora suffered minor damage and was able to get in and out of the pits without losing a lap. Evans and Bob Presley (Olympia, WA) would battle for the lead on the restart. While Evans was able to hang on to the lead, he developed brake issues and Presley swooped in to take the lead away. Evans brake issues ended his night early. Moriarity was able to reel in Presley a few laps later to take his turn at the lead. Schimmel was quietly waiting for her opportunity at the front, and she got it. Quickly putting distance between her and Moriarity, she started picking her way through traffic. Cress, who had been consistently gaining from his ninth qualifying position, now had Moriarity in his sights. A late race caution was not what Schimmel wanted to see but set up a great finale for the fans. Schimmel and Cress would battle it out for the lead, and eventually the win.